The post mill is Grade I listed and the smock mill previously Grade II listed. The mills were worked by successive generations of the Clover family from 1775. The post mill was built in 1689, making it the oldest windmill in Suffolk, with some claim to perhaps having the oldest timbers in a windmill in England. In 1949 the mill was badly damaged and became derelict until Wilfred Clover restored it in 1962. By this time, although still working, it was a hobby rather than a full commercial enterprise. 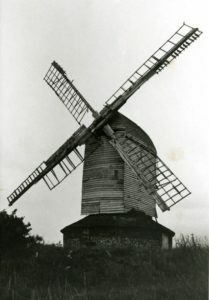 In 1997, the mills were sold by the Clover family and in 2002, the sails of the post mill, which were rotting, were removed for restoration. The next owners set about continuing Wilfred Clover’s restoration with a very ambitious project, There was extensive fund r aising, including a grant from English Heritage, who put the mill on the Heritage at risk Register. Work started on the post mill in May 2005, using some of the best building conservation people in the country – millwrights Vincent Pargeter and Neil Medcalf; architect Tim Buxbaum; engineer Brian Morton; main contractors R & J Hogg; mill expert Chris Hullcoop; English Heritage surveyor Trudi Hughes and architectural historian Leigh Alston to name but some of the team. Between them they came up with a solution for pulling together the 16th century frame of the mill without losing more of the original timbers than necessary and repairing the windshaft which carries the sails which had rotted through the centre. When these owners relocated to Scotland in 2006, the site was bought by the current family who have been continuing the repair and conservation of the mills. In 2007 work finished on the buck (the body of the post mill). In 2016, using a lot of the same team, and after a 3 year planning stage, work was completed on the roundhouse underneath the buck leaving the post mill structurally sound and ready for the next 100 years, and looking wonderful. 2016 was also the 400th anniversary of the first reference to a windmill on this site, although wood dating techniques show some of the timbers used in the construction of the post mill were originally chopped down in 1543. The owners have been working with Historic England (the new name for English Heritage) to get the smock mill re-listed and in November 2016, the Department For Culture, Media and Sport upgraded it to Grade II*. 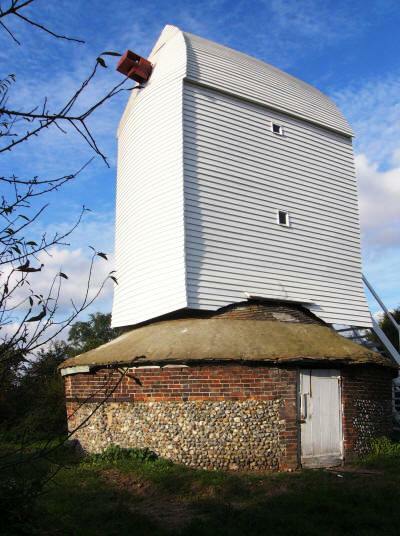 This recognised its unique structure, being an 8-sided smock mill sitting on top of a 16-sided horse mill. The owners hope to start work on restoring it in 2017. There is an excellent photographic and video record of the restoration in the History Archive.